What can bubble teams do to get into the NCAA tournament or to feel safe on Selection Sunday? Bracketologist Michael Beller provides paths for 23 fringe teams. March has arrived and Selection Sunday is fewer than two weeks away. Seeding is still fuzzy, but the big picture is becoming clearer. The way we see it in the Bubble Watch, there are 14 spots remaining for 23 teams, with two of those spots belonging to the automatic qualifiers from the Missouri Valley and West Coast conferences. That means we’re more likely looking at 12 bubble spots for 21 teams, depending on what you think of the at-large candidacies of Wichita State, Saint Mary’s and Gonzaga. Yes, it is possible that a team that enters this week feeling pretty secure about its chances, like Saint Joseph’s or South Carolina, could still fall apart while a handful of the 21 teams on the bubble surge over the next two weeks, ultimately sending one of the seemingly safe teams to the NIT. Those outcomes, however, are rather unlikely. Instead, we want to focus on the more likely outcomes that will shape the back end of this year’s tournament field. As such, the Bubble Watch over the next two weeks will include just those teams that are legitimately on the bubble. If you can’t find your team and are being realistic about its chances (i.e., a hopeful Texas Tech fan, not a delusional UCLA fan), it means we consider your team a lock. With that, let’s get to the Bubble Watch for the final week of the regular season. Teams are listed in order of their status in this week’s Bracket Watch. The Panthers have been in the field of 68 in every Bracket Watch of the season, but they haven’t really felt safe since losing to North Carolina State and Clemson at the end of January. On Sunday, they finally notched the signature win they lacked all year, upending Duke by 14 points at home. Pitt is still just 1­–6 against the RPI top 25 and 2–6 against the top 50, but it doesn't have any losses outside the top 150. The Panthers are starting to look like a good bet for inclusion in the field, especially when you consider how soft the bubble is behind them. Path to safety: Two more wins should do the trick, whether they both come this week, or one comes in the ACC tournament. Pitt won’t get a chance to build its résumé in the ACC tourney until its second game, but it has done enough to this point that it likely won’t need to add any big wins to get an at-large invite. It has only been five weeks since Providence beat Villanova in Philadelphia to move to 5–2 in the Big East, but it might as well have been five years ago. The Friars are 3–6 since then, with their wins coming against Georgetown and DePaul. They definitely still retain an inside track among the bubble teams, but they’re just 1–4 against the top 25 and 2–6 against the top 50, which is borderline shocking for a team with two talents like Kris Dunn and Ben Bentil. The fact that Providence was swept by a Marquette team that doesn't have a single other league win against a team above it in the conference standings will forever be one of the mysteries of the 2015–16 college basketball season. If the Friars suffer through a disastrous nexrt two weeks, it could also be what ultimately keeps them out of the Big Dance. Path to safety: Win both of those games against teams they are already 3-0 against this season and then advance to the semifinals of the Big East tournament. Doing so would almost certainly mean adding a win over Butler, Seton Hall or Creighton, and a loss to Villanova or Xavier to the résumé. That should be good enough. The Beavers swept the state of Washington at home last week, beating the Huskies and Cougars to get back to .500 in the Pac-12. The traditional indicators of RPI and strength of schedule will be their friend, as will the improving profiles of Oregon, Utah and California, all of which they have beaten this season. Oregon State is 3–4 against the top 25, 6–7 against the top 50 and 9–10 against the top 100, without a bad loss on its ledger. It’s not an overwhelmingly strong résumé, but it’s one that definitely suggests an at-large bid will be coming their way on Selection Sunday. Whether or not they actually win a game in the tournament remains to be seen. They’re just 83rd in adjusted offensive efficiency on kenpom.com. Path to safety: Beat USC. That would give the Beavers their first top-50 road win of the year. Short of that, the only way they can feel safe on Selection Sunday is by advancing to the Pac-12 tournament semifinals, which would almost certainly include a win over one of the conference’s sure-fire at-large teams. The traditional indicators that are working for Oregon State are working against Connecticut. Despite the Huskies' pedestrian RPI rank and strength of schedule, however, they are 2–1 against the top 25, 3–2 against the top 50 and 6–9 against the top 100, without a sub-100 loss on their résumé. More often than not, that adds up to an at-large bid. Still, a home loss on Sunday to a Houston team with an RPI barely inside the top 80 was not what UConn needed. That defeat didn’t knock the Huskies out of the field of 68, but it set them up to potentially fall out with one more misstep. The Wolverines have lost three of their last four games, all of which were on the road, and two of which came against teams we have locked into at-large berths (Maryland and Wisconsin). There’s not really a bad loss on their résumé, with their only sub-50 defeats coming to Connecticut on a neutral floor and Ohio State in Columbus. If they follow that script over the next two weeks, they will be in the field. If they don’t, however, they could be doomed by their 3–10 record against the RPI top 100, which would likely get worse if they were ultimately on the outside of the tournament picture. 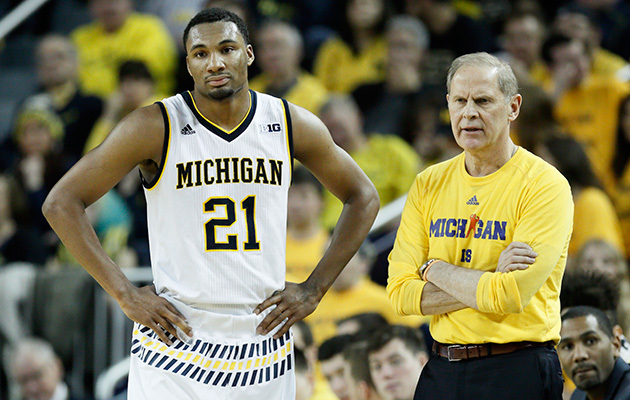 Senior guard Caris LeVert missing the rest of the season with a lower leg injury will not help Michigan. Path to safety: Beat the Hawkeyes, or win one game in the conference tournament. That would give the Wolverines either a fourth top-25 win, or preclude them from suffering a bad loss. Either outcome should earn Michigan a trip to the dance. Remember, it already has wins over Texas, Maryland and Purdue. Few bubble teams can boast so strong a trio of victories. The AAC is going to be one of the most interesting conferences over the next two weeks, with four teams battling for at-large bids. Temple is one of those four. It’s hard to ignore the fact that the Owls went 6–1 against SMU, Cincinnati, Connecticut and Tulsa this season, with sweeps of the Huskies and Bearcats. At the same time, they have just one top-40 win, and two losses outside the top 150. Path to safety: Avoid any more bad losses. Temple only has low-caliber teams left in the regular season, but it must win both of those games. That would guarantee the Owls a share of the regular season conference title, and make them the No. 1 seed in the conference tournament, which would mean a date with one of the four conference doormats in their opening game. In other words, if Temple wins its next three games, it will be happy on Selection Sunday. Path to safety: Syracuse probably needs to go on a run in the ACC tournament to feel comfortable on Selection Sunday. It absolutely needs to beat Florida State in Saturday's regular season finale. The last thing the Orange want to do is go into Selection Sunday off a conference tourney loss to a team like Virginia Tech or North Carolina State, their likely opening round opponents in the ACC tourney. Cincinnati swept Connecticut, won at VCU and beat Tulsa at home this season. Those are the Bearcats’ four best wins of the season. They’re 0­–3 against the top 25 and just 2–4 against the top 50. In fact, Cincinnati is under .500 against every RPI subset the committee will examine on Selection Sunday. There’s not much wiggle room for this team. The Bearcats enter the final week of the regular season as the last team in the field to avoid the First Four, and one more loss could send them not to Dayton in the opening week of the tournament, but to the NIT. Thursday’s trip to Houston is a sneakily tough game that could be their death knell. Path to safety: Win at least one game this week and get to the AAC tournament championship game. There’s probably a path with fewer roadblocks, but not another one that will keep Cincinnati's collective heart rate in check on Selection Sunday. If the Bearcats lose to Houston and SMU this week, it could very well take and AAC tournament championship for Mick Cronin’s bunch to get in the field. The Bulldogs got a win they absolutely had to have against Georgetown last week, though they tried their best to give it away before winning by three in overtime. They’re yet another team that is mostly making its way toward a bid by avoiding bad losses, with just two defeats coming against teams outside the RPI top 50. That equals their number of top-50 wins, however, meaning they’ll be given very little leeway from the committee. 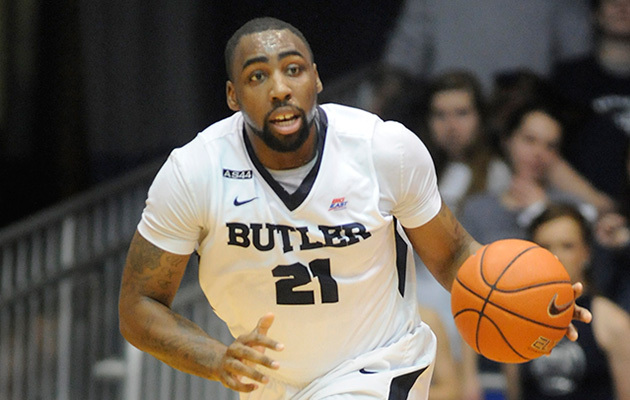 Butler won’t feel safe unless it does some real damage over the next two weeks. Path to safety: Win out and advance to the Big East tournament championship game. That would give the Bulldogs wins over Seton Hall and likely one of Villanova or Xavier, without adding a bad loss to their résumé. They can definitely get in without that strong a finish, but that’s the only way they’ll feel safe. Vanderbilt has been one of the nation's most disappointing teams all season, but it came through swimmingly with its tournament life at stake last week. The Commodores started the week by trouncing Florida in Gainesville, and then punctuated it with 12-point home victory over Kentucky. They’re now 2–6 against the top 25 and 5–7 against the top 50, with one more big opportunity remaining in the regular season. When Vandy is at its best, it is the third-best team in this conference, and it has a ceiling that is just as high as Kentucky’s or Texas A&M’s. If the Commodores get in the dance, they will be dangerous. Path to safety: Beat Texas A&M or avoid bad losses. Vanderbilt has too many strikes against it—losses to Mississippi, Arkansas and Mississippi State stand out—to climb much higher up the bracket, but as long as it doesn't lose to Tennessee this week or a bottom-half team in the conference tournament, it will be headed back to the NCAA tournament for the first time since 2012. The Shockers won their final five games of the regular season, cruising to their second straight MVC regular season championship. Having said that, they don’t have a realistic path to an at-large spot. They may have dominated the MVC, and they certainly have a name brand, but that won’t obscure the fact that they had one top-100 win this year, albeit a very strong one over Utah. Their first game in the MVC tournament will be against the winner of Loyola-Chicago and Bradley. If they win that game, they’ll take on the winner of Northern Iowa and Southern Illinois in the semifinals. A loss in any of those games would almost certainly send them to the NIT. Even if they advance to the conference championship game only to lose to a solid Evansville or Illinois State team, there simply won’t be much meat on their at-large résumé. The Bubble Watch Committee here at SI.com really can’t wait for the AAC tournament to get going. That's the only thing that will provide clarity in this conference. Their contenders’ résumés are so similar that it’s hard for one team to stand out. Tulsa looked ready to make a move last week, but lost at Memphis after scoring a big win over Temple. The Golden Hurricane are 1–1 against the top 25, which simply reflects their season split with SMU. It’s hard to imagine all four potential at-large teams in this conference making the dance, even if they’re the four teams that reach the conference tournament semifinals. That makes advancing to the AAC championship paramount for all four. Path to safety: The only way Tulsa will be absolutely safe is if it wins the AAC’s automatic bid. Still, if the Golden Hurricane they take care of South Florida this week and then advance to the conference tournament championship, they’ll at least have the inside track at one of the two at-large bids this conference is likely to get. We’re not going to have a great read on the Crimson Tide’s tourney hopes until we’re a few days into the SEC tournament. If they’re still alive at that point, they’ll be trending in the right direction. If they aren’t, it’s probably going to be hard for them to get in. They had a great run in the middle of February when they knocked off Texas A&M, Florida and LSU in succession, but all that did was put them in range of getting an at-large bid. It didn’t do anything to lock them into the dance. Then, of course, they lost at home to Mississippi State. That’s the sort of loss teams just can’t afford when they’re on the bubble. Alabama and Tulsa should be viewed as the last two teams in our field for the time being. Path to safety: Win both of their games this week and advance to the SEC championship with at least two résumé-building wins (think South Carolina, Vanderbilt, Texas A&M and Kentucky) along the way. Anything short of that, and the Tide will be sweating on Selection Sunday. It wasn’t that long ago when Florida appeared to be heading to a stress-free Selection Sunday. Since then, the Gators have lost four of five games, with their last meaningful win having come on Jan. 30 against West Virginia. Perhaps most damning is their 2­–9 record against the RPI top 50. In essence, the one thing they’ve showed the Selection Committee is that they cannot regularly hang with tournament-quality competition. Florida has strong metrics, but it will have no one to blame but itself if it falls short. Path to the dance: The Gators can’t simply get in by hoping the teams in front of them fail while they simply beat the teams they’re supposed to beat. A win over Kentucky this week could vault them in front of the likes of Alabama and Tulsa, but they’d still need to get a few wins in the SEC tournament to feel secure. Short of taking down the Wildcats, they’ll need to do major damage in the conference tourney, potentially needing to advance all the way to the championship game. The Rams had a seriously up-and-down week, losing to a terrible George Mason team before bouncing back with a desperation win at George Washington. That washed most, but not all, of the bad taste from their mouth after losing to the Patriots, who rank 191st in RPI. That defeat was VCU's second of the year to a team with an RPI rank of 170 or worse, and that’s going to be awfully tough for the Selection Committee to forgive, especially when the Rams also have zero top-25 wins and just two victories over top-50 teams. VCU simply cannot lose again to a team that isn’t tourney-bound. Path to the dance: The Rams must win both of these games this week, though Dayton’s profile has cratered over the last few weeks. If they do that, they’ll guarantee themselves at least a share of the A-10 regular season title. And if they follow that by advancing to the conference tourney championship, they’ll likely crowd out one of the teams in front of them in this week’s Bracket Watch. The Bonnies have done great work to get themselves into the at-large discussion this year, something that seemed unthinkable at the beginning of the season. Still, they’re just 2–2 against the top 50, with a pair of losses outside the top 150 (Duquesne, La Salle). The committee will definitely give them points for both of those top-50 wins coming on the road (at Dayton and at Saint Joseph’s), but it won’t be enough to get them over the hump. St. Bonaventure is in range of on at-large bid, but it likely needs a couple more wins to really make a strong case. Path to the dance: Both of the Bonnies’ remaining regular season games are crucial. A win over St. Joe’s would give them another in the top 50 (potentially in the top 25), while they cannot add a loss to a dreadful Saint Louis team to the résumé. They’re in the same boat as VCU, and there may not be room in the field of 68 for both of them. They could very well be on a crash course to meet in the A-10 semifinals, which could end up being a de facto play-in game. If Selection Sunday were last weekend, and we here at SI.com determined the field, the Bulldogs would have been one of the first four teams out of the dance. Having said that, they do not have a realistic path to an at-large berth. That’s what happens when you don’t win a top-50 game all season and go just 3–7 against the top 100. All the bad-loss avoidance in the world doesn’t mean a thing when your three best wins come against Connecticut, Washington and BYU. The wheels fell off for the Huskies in the second half of the Pac-12 regular season. Ten games into their conference season, they were 7–3 with a sweep of UCLA and single wins over USC and Colorado. They’ve lost six of their last seven games since, falling to all of the conference’s certain or likely tourney teams, other than USC, during the stretch. They remain on the at-large radar, but they’ll need a ton of help from the teams ahead of them if they’re going to get into the dance without winning the Pac-12 tournament. Path to the dance: Short of winning the Pac-12 tournament, Washington will need to beat Washington State this week and two of Oregon, Utah, California and Arizona en route to the conference championship game. Do that, and the Huskies could probably withstand a loss in the Pac-12 final. Thanks to the unbalanced schedule in the Big Ten, Ohio State got to 10 wins in the league without picking up a single one against the conference’s six sure-fire tournament teams. It finally took down one of those teams with a home win over Iowa last weekend. That was the Buckeyes' second top-25 win of the season, joining an earlier, unlikely triumph over Kentucky in Brooklyn, N.Y. Unfortunately, they still only have as many top-50 wins (three) as they do sub-100 losses. What Ohio State does have going for it, however, is its conference. Indeed, the Buckeyes have one more chance to score a big win in the regular season when they visit Michigan State this weekend, and they will get at least one opportunity in the Big Ten tournament to add to their résumé, so long as they can beat one of the conference’s bottom-four teams in their first-round game. The Colonials have one great win (over Virginia) and one very good win (against Seton Hall), both of which will work significantly in their favor if they can do well in the A-10 tournament. The win over the Cavaliers is especailly helpful, and while Virginia would likely beat GW eight times out of 10, no one can scrub that win from the latter's résumé. TOn the flip side, the Colonials lost to DePaul and Saint Louis, a pair of teams that could end the season outside the top 200 in RPI. Those wins, as well as a road victory over VCU, still give George Washington a puncher’s chance to get one of the last at-large spots in the field of 68. It is, however, going to require a deep run in the A-10 tournament. Path to the dance: The Colonials need to win both of their games this week. Davidson isn’t a bad team by any stretch of the imagination, but that doesn’t really matter given where GW sits in the at-large pecking order. It simply cannot lose to any nontournament team, and Davidson will not be going dancing unless it can borrow Steph Curry for a couple weeks. From there the Colonials will need to, at the very least, reach the conference championship game, with two wins over the likes of Saint Joseph’s, Dayton, VCU and St. Bonaventure along the way. The issue for their at-large candidacy is that wins over the latter two teams, one of which they’ll likely meet in the A-10 quarterfinals, may not move the needle all that much. It’s an uphill battle, to say the least. When the Tigers beat Texas A&M just two weeks ago, it appeared we’d all be treated to seeing Ben Simmons in the Big Dance in what will almost certainly be his lone college season. After that game, they lost three straight to Alabama (at home), Tennessee and Arkansas. The latter two teams have no hope of securing an at-large bid, while the Crimson Tide are one of the last teams in our current field of 68. Those are all damaging losses for LSU, especially since the one against Alabama came in Baton Rouge. The Tigers are 2–2 against the top 25 and 5–5 against the top 50, but they have six losses to teams ranked between 101 and 150 in RPI. Perhaps the only thing they have going for them is a trip to Lexington to wrap up the regular season on Saturday. Path to the dance: Beat Missouri, beat Kentucky, and get at least one more meaningful win in the SEC tournament. That would at least force the committee to debate LSU's qualifications on Selection Sunday. A second meaningful win in the conference tournament could very well put the Tigers over the hump. I know, I know. We here at SI.com should probably give up our crush on the Tigers after their losses to North Carolina State and Georgia Tech last week. Their RPI rank is terrible, and their strength of schedule isn’t much better. They've also lost to Massachusetts and Minnesota, dropped games to Alabama and South Carolina at home and lost to Georgia by 23 points. And yet, we refuse. The bottom line is that a team with wins over Miami, Duke and Louisville isn’t dead until late Sunday night. Given the opportunities in front of the Tigers, they aren’t dead just yet. Path to the dance: Yes, it is a long shot, but if Clemson can upset Virginia on Tuesday, it would potentially be the only team to beat four of the top five in the ACC (Miami, Louisville and Notre Dame all still have a chance to do so). If the Tigers do that and then go on to advance to the conference championship game, they’d likely have beaten one or more teams from among North Carolina, Miami, Virginia and Duke. Is that team dead? We sure don’t think so.